Disclaimer:This review contains spoilers for previous volumes. 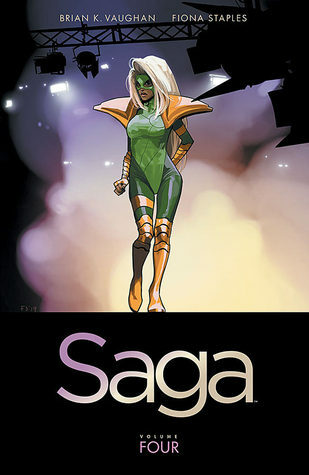 I’ve been a big fan of Saga but this volume left me somewhat indifferent. Time has moved on since the last volume. Hazel has grown from a baby into a toddler while the family has been hidden away on a planet called Gardenia. Alana has joined the Open Circuit–a show something like World Wrestling Entertainment–in an effort to help the family to make ends meet. It also provides her with a handy disguise but the job is sucking the life out of her. Meanwhile, Marko keeps a low profile as a stay-at-home dad. This makes for a nice inversion of traditional gender roles. The cracks in the family really start to show in this volume. Alana develops a drug habit, Marko has to decide whether to fend off the advances of an overly friendly neighbour and Klara seeks a way to overcome her grief. There are communication problems of all kinds. In fact, one of my favourite moments is when both Alana and Marko are away, leaving Klara and Izabel without the benefit of the translator rings. The cracks are also literally beginning to show for Prince Robot IV. After he discovers his wife has given birth, he decides to seek help from his father. The King was another example of some great character design which left me chuckling. In fact, the visual elements around the denizens of the Robot Kingdom are particularly clever. Being humanoid but with televisions for heads, the images they show on their screens in times of high emotion often lend an extra layer to scenes. I feel my apathy in relation to this volume mostly comes from Alana’s drug habit. Until Marko came along, everyone around her thought of Alana as a screwup. In the case of her former military career, this was because Alana had qualms about slaughtering innocent people, making this view of her hardly seem just. So seeing her turn to drugs made me really disappointed. However, this is definitely my issue and not an issue with Saga. From the very beginning, it has been a gritty story and not one where the characters are always (or even mostly) their best selves. In fact, it is their struggles and mistakes that make the characters so easy to relate to. The volume finishes with another unlikely alliance–something that the series has been so good at–so I continue to look forward to the next instalment.